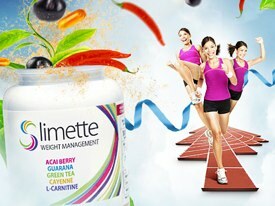 Slimette is a weight loss supplement produced by a company based in United Arab Emirates and shipped worldwide. Described by the manufacturers as a “weight loss booster system”, the product is designed to provide additional support to—and work in conjunction with—other slimming aids or techniques to encourage weight loss and facilitate increased energy levels. Although Slimette is marketed as having a unique list of ingredients, all of the entries on that list can be found adorning the contents labels of countless other dieting products. Only the mix is different, but at least it does not claim to be a one stop dieting solution, and that in itself is refreshing. 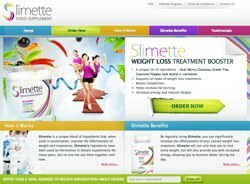 What Is Slimette And How Does It Work? The pills contain a wide variety of natural ingredients chosen for their reputations as fat metabolizing agents or for their believed ability to act as a stimulant and boost energy levels. The recommended dosage is 2 to 4 capsules a day, taken twice a day, at breakfast and lunch. This is, of course, in addition to any supplements that are being used as part of any existing diet. Although there is fairly decent set of ingredients contained in the formula it looks at least 3 years out of date. Cayenne Extract is the standout but only minimal quantity is included. Acai Berry Fruit Extract 4.1: Acai berries are a natural source of antioxidants and can also help reduce cholesterol levels, but the many claims that Acai can aid weigh loss have never been successfully proved. Guarana Seed Extract: High in caffeine and a proven stimulant, Guarana’s reputation goes before it. There are 400 mgs in each pill, so it seems likely that any claims of increased energy may be valid, but there is no evidence that the seeds promote weight loss. Green Tea Leaf Extract: Another source of caffeine and also high in antioxidants, but there is no concrete proof that green tea has any effect on the metabolism. Cayenne Extract: Scientifically proven to increase the metabolism, Cayenne is a popular ingredient in many slimming aids, but with only 12.5 mg per tablet the quantity is probably insufficient to produce any significant effect. Acetyl L-Carnitine: Has proved its worth in many different areas, but its value in the weight loss arena has never been tested so any claims for its prowess cannot be backed up. Bioperine: A patented form of the alkaloid piperine (found in black pepper). Tested and proved to boost the metabolism. Chromium: Dubbed the “glucose tolerance factor” in the 1950s for its ability to improve glucose tolerance in animals, but vastly overrated as a slimming aid. A study conducted in 2007 provided no evidence of fat loss. Each of the test subjects received 200 mg of chromium a day. Slimmette contains just 10 mcg. Vitamin D3: Some evidence suggests that vitamin D3 may be beneficial to weight loss, but its effects on the body are not fully understood. Expert opinions about D3 vary, but its presence may have merit. The product has not had the benefit of mass media advertising, nor has it received any celebrity endorsements, so the name Slimette is likely to be unfamiliar to many people. Although the product is available in online marketplaces, including Amazon, the Slimette website appears to be the only place that offers a significant amount of testimonials. Customer feedback from independent sources would be more meaningful. The manufacturers state that their product has no known side effects, but the high caffeine content may be a cause for concern. High doses of caffeine may produce the jitters and heart palpitations. The fact that this supplement is designed to support other weight loss solutions, which may also contain caffeine, is especially worrying; so this product cannot be recommended for pregnant or nursing mothers, or those who are taking prescribed medication. Anyone who has doubts about their health should, of course, seek medical advice before commencing any new diet or beginning a course of pills or supplements. Some of the ingredients in this product have been proved to aid weight loss when used as part of a calorie controlled diet. Others, though not proven, have a good reputation and may also be beneficial. Sadly many of the ingredients that are likely to show positive results are hindered by low inclusion quantities. It seems probable that users may experience the promised increase in energy, but the caffeine that is likely to be fuelling this may produce some nasty side effects, so the negative implications of using this supplement may prove to be the most notable results attained. Slimette is a well packaged product that makes some impressive claims, but it seems unlikely that the product will live up to the marketing and independent reviews are in short supply, so this is not a recommended product. Prices start from £27.60 (at time of publishing) for a single bottle with price breaks for multi-moths purchases. Garcinia Cambogia and Raspberry Ketone are the two ingredients that most manufacturers appear to be adding to their formula’s – and not without good reason. Both are arguably the two most effective natural fat burners in existence. Garcina Cambogia Extra contains both in the recommended dosage, it is a premier slimming supplemment and should be added to your wishlist.